Medical science is undergoing a paradigm shift as the script of disease is being written in a new language - the language of molecular biology. Within the next decade, anyone not conversant with this language will be pushed to the margins of front-line medicine. There is an urgent need for all doctors and especially those in the academic field to understand molecular biology and interpret the technologies associated with it. Skills like devising a PCR test or analysing sequence data can no longer be left to the laboratory scientist but has to come within the ambit of a physician's capabilities. 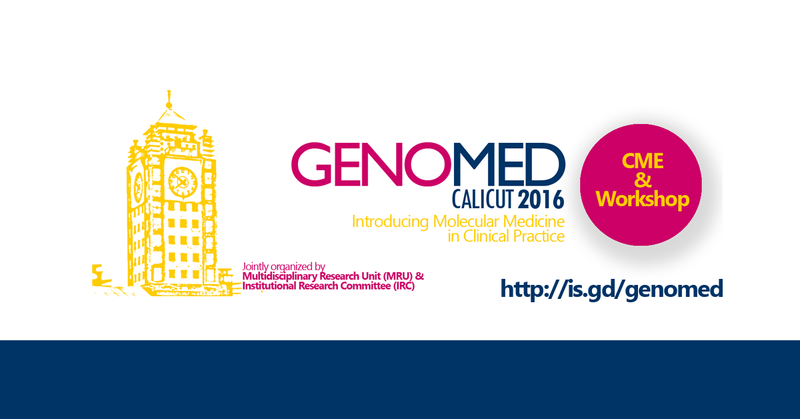 The ICMR backed Multidisciplinary Research Unit (MRU) and the Institutional Research Committee (IRC) of Calicut medical college are jointly organizing a 2 phase workshop (GENOMED 2016) with the above mentioned objectives in mind.